For most anglers, fishing is a luxory enjoyed on the weekends or on vacations. Very few fishermen are able to make their passion into a career, but Jim Litchfield of Reno, Nevada, has made a life out of his passion for fish, rivers, streams and waterways. Litchfield is the owner of the Reno Fly Shop, but he has also spent much of his life working as a surface water hydrologist, making a difference in the management of surface water resources. Surface water is any water that is collected above ground, such as rivers, streams and lakes. As the owner of a fly shop and an avid flyfisherman, Litchfield also spends time as a flyfishing guide. No matter what Litchfield decides to invest himself in, it is clear that he has always pursued his interests, and acts in hopes to benefit the Reno Tahoe area. As a young boy, growing up in Las Vegas, Nevada, Litchfield found joy in all types of fishing. He developed his love for the Sierra Nevada waterways through visiting his grandparents in the Eastern Sierra Nevada Mountains. By the time he was around the age of 9, Litchfield began flyfishing; a hobby and passion that would last him a lifetime. After graduating from University of Nevada, Reno, with a masters degree in surface water hydrology in 1994, in addition to his bachelors degree in Geology, Litchfield held the career of a surface water hydrologist. Litchfield worked as a private consultant for approximately 20 years. He represented organizations and dealt with the management of surface water resources. As a hydrologist, Litchfield was a valued factor in many recreational projects, as well as agricultural projects. Our water resources have a direct relation with the wildlife living in them, especially the fish. Fish can be effected so easily due to the very specific environment that they require to survive, including amounts of flowing water, the water’s depth, and its temperature. In April of 2014, when there is typically maximum snow pack, the Truckee River Basin measured only 34 percent of its normal amount of water. Along with that, the Lake Tahoe Basin was measured as 47 percent of its normal amount. This drought has drastically effected the lives of fish in the Truckee river, which also greatly effected the fishing in the Reno/Tahoe area. Though our Sierra Nevada water resources took a hit from the drought, the recent precipitation has been revitalizing our water resources significantly. The Sierra Nevada snow pack is currently more than the average amount, according to a story on NPR. Snow pack has an incredibly significant impact on the surface water resources. In fact, the Truckee river was recorded to be flowing at around 1,000 cubic feet per second by the US Geological Survey Reno station on March 13. Litchfield designed white water parks in both Reno and Sparks, Nevada, on the Truckee river; a water way that holds a very special place in his heart. This career offered Litchfield the opportunity to travel and design similar projects around the western United States, as well as around the world. This also allowed him to utilize our water resources in new and creative ways, without wasting or depleting that resource. After ending his career in surface water hydrology, Litchfield has made a career of the Reno Fly Shop. He says that the first few years of operation had been challenging, but he is enjoying running the shop. The recent drought had also impacted his business significantly. Due to the shortage of water, less fish are able to survive in the rivers and streams, thus slowing fishing and the fishing business. Thanks to support from the community, as well as Litchfield’s commitment to the Reno Fly Shop, Litchfield believes that he is coming out of it strong. Running any small local business can be tough at times, even without having a drought effecting the fishing business. Attracting customers is not always easy when there are many large commercialized outdoor stores nearby. Litchfield seems to have found a new way of attracting customers; not only by keeping the very best quality products on hand, but also by providing information and sharing refined knowledge, something that is becoming more and more scarce each day. Litchfield also has a podcast as a way to share his inside knowledge to many listeners. As a fan of podcasts himself, he saw the shop as an incredible opportunity to create a podcast that reaches a very specific niche; those interested in fishing the Reno-Tahoe area, a world class destination for flyfishing. Litchfield reopened the Reno Fly Shop in 2014. He decided to continue the shops legacy, pioneered by former owner Dave Stanley, who ran the shop for 28 years, until its closure in 2010. Though Litchfield has a very special relationship with fishing, he believes that his love of fishing is purely an expression of his love for rivers and streams. Along with an informative podcast, Litchfield maximizes the shops reach by giving a fishing report on the shop’s website. If a customer wants a more hands on approach to gathering information about local fishing, there is no better way than visiting the Reno Fly Shop in person and picking the brains of employees and other customers alike. Another hands on approach would be to take a trip on the water with the Reno Fly Shop’s guide service, also run by Litchfield. Just as the Reno Fly Shop is extremely community oriented, so is Litchfield. 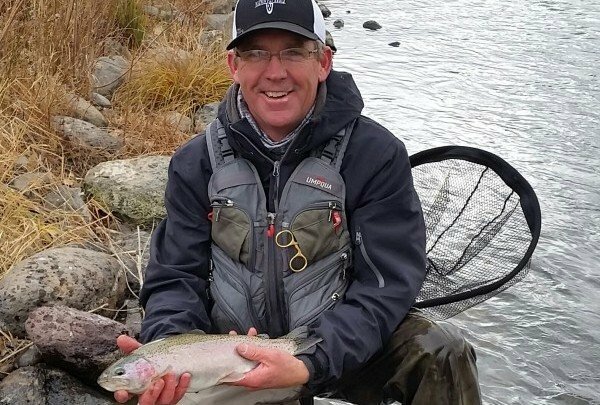 Partnering with a math teacher at Reno High School, Litchfield plays a huge role in the school’s flyfishing club, which is now one of the largest and most active clubs on the Reno High School campus. He supports the club in any way that he can, including being a great resource for the students to learn from. Litchfield plans to continue the Reno Fly Shop’s brick and mortar style of local business. He hopes to fine tune all aspects of the shop, with an emphasis on guiding, teaching, working with camps and schools, and refining what he believes to be the core values of the Reno Fly Shop.